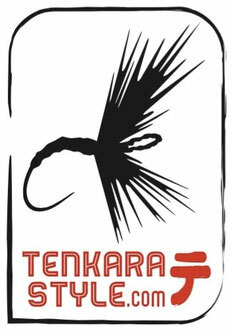 Tenkara is a very liberal community about the choice of flies but as I am an "old school" pattern user. I think it is more interesting to offer only the patterns I am used to fish with. As you will see it is mainly traditional Japanese patterns or patterns developed from Japanese teachings. Give these simple kebari a try and you will understand why I like them so much. All the kebari offered on this site are tied in Normandy, France. This parachute dry pattern was developed through the years in order to have a go to dry fly that would be efficient on any stream you might go fishing. This pattern is tied on a Tiemco 900BL size 14 hook and is made of a mix of natural hydrophobic dubbing with antron dubbings. This traditional kebari originated in the Kurobe valley, in the Toyama prefecture in Japan. It is tied on a size 号8 (European 12) Kaizu type of hook (made by Maruto) which is a heavy wire hook. The eye is made of natural silk. Hand tied in France. This is probably the most iconic kebari used by Masami "Tenkara-no Oni" Sakakibara. This big sized pattern is his typical choice for "sasoi" and prospect a stream when there are no signs of fish activity. Tied on Nissin S10B size 8 hook. Perfectly fit to fish behind the rocks and shallow eddies. Tied on TMC 2499SP size 14 hooks. The Yamato kebari is a very versatile pattern which is basically a wet fly for sight fishing as its light coloured body and contrasting rusty orange head makes it very easy to spot under the water surface. As it is an unweighted kebari one can also use it as a dry fly. Try this kebari and I have no doubt that after you will always carry a few in your flybox! Tied on Nissin SP10-BL hook size 12. This traditional tenkara pattern is made of zenmai, fiddle fern fibers, and it is an amazingly effective kebari on any water. Perhaps is it due to the transparency effect of the zenmai fibers when wet. We follow the tradition with tying this pattern on golden Kanta hooks made by Maruto. Size is 12.